You can choose from 500 fonts that are available or you can easily upload your own cufon fonts using built-in uploader. Google fonts are also supported. 6 different Page Sliders are supported. You can easily upload and reorder slider images in the theme’s options page. Upload your own images for each section of the website. You’ll also be able to position the images in variety of configurations. Features a streamlined web development workflow by providing you with commonly used dimensions of web pages based on a width of 960 pixels. 12 custom sidebars are available. You can position your sidebars as left or right at any time for each section independently. Planning to buy U-Design theme from Theme Forest. Buy with Confidence. This page provides you with all possible Buying options. Usually Buying options or Pricing page of any theme designer is designed for conversions (to attract users and convince them to buy). Our Buying options page is not like that. We provide all the information about each Buying option. No hidden text or terms. We tried to cover everything that you should know before buying this theme. I appreciate your comment. 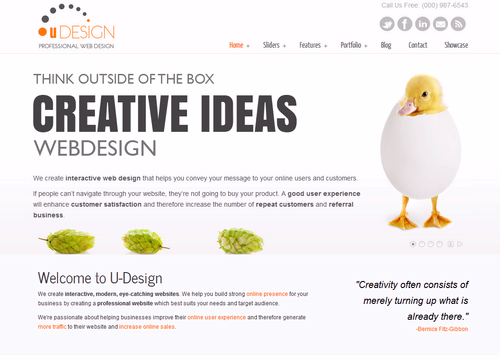 This theme is good for agencies who develop websites for clients.